Why is it okay – in some cultures – to jaywalk, while in others you could get arrested for jaywalking? Why was marijuana was sold – legally – for years in the streets of Amsterdam when it is only now become legal in the US? The reason: some cultures are what author Michele Gelfand calls “loose” and others are “tight”. Here’s my first episode on cross-cultural psychology and I think you’re going to really enjoy listening to professor Gelfand to find out how our culture’s norms shape our attitudes and behavior. 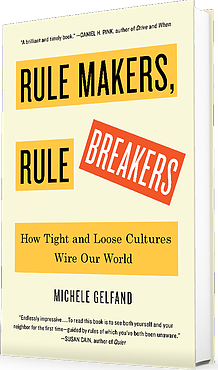 Rule Makers, Rule Breakers was listed by Adam Grant as one of the 6 new books about psychology that will help you succeed at work. Rule Makers, Rule Breakers on Amazon. This episode sponsored by Wix. I use Wix to create lots of online educational activities, so check them out!